Q. Why can't I place a hold at cloudLibrary? When I try to place a hold at cloudLibrary, I see a message saying I have too many holds already. I've never place a hold at cloudLibrary - what's going on? cloudLibrary is an eBook Lucky Day collection. What that means is that we don't allow holds on the items there -- you just stumple upon them -- you're lucky! The loan period on eBooks from cloudLibrary is 7 days, and the loan limit is 2 items at a time. For more information, check out this blog entry. This message should actually show you the date that the item will be returned, but the messaging is wrong, and cannot be changed at this time. The cloudLibrary app does display correctly -- if you are able, we recommend that you use the app to check on the status of an item. If you aren't able to use the app, check back at the cloudLibrary site periodically over the next 7 days -- the item will be returned during that time. We are very sorry for the inconvenience! We will correct this as soon as we can. Image text reads: Cannot Hold. 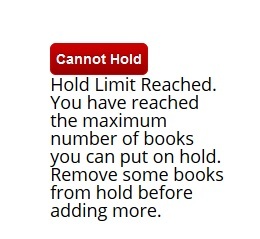 You have reached the maximum number of books you can put on hold. Remove some books from hold before adding more.